Meghan Markle‘s fashion tour Down Under continued on Friday with an embellished ball gown fit for a princess. While attending the Australian Geographic Awards in Sydney, the Duchess of Sussex, 37, wowed the crowd in a black and white Oscar de la Renta evening dress completely covered in birds. Her tulle gown, which is similar to a $6,000 style by the designer, features embellishments crafted by Sarah Esmoingt. The ethereal bird pattern is laser-cut from black bonded looped ribbon tweed, and wraps majestically from the dress’ bodice down to just above the hem. 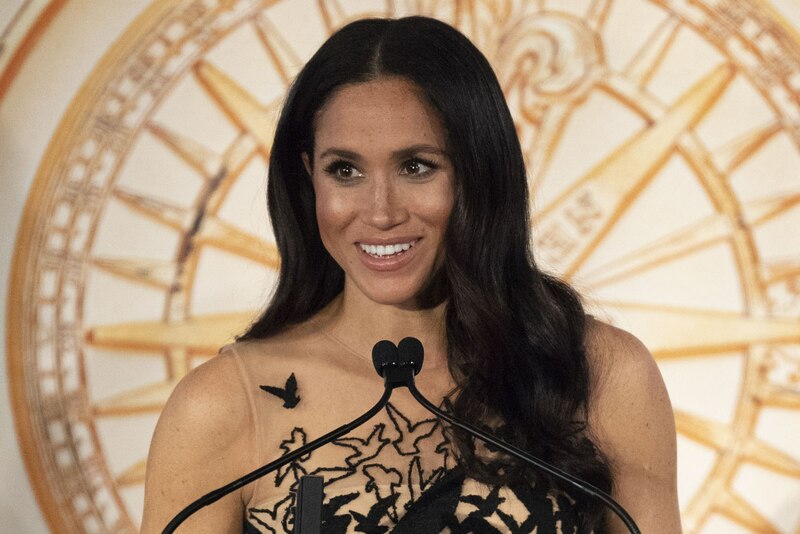 Markle paired the show-stopping look with her favorite black suede heels from Aquazurra ($750) and kept her hair down to present the Young Conservationist of the Year Award. Arguably the duchess’ most extravagant outfit since kicking off her royal tour of the South Pacific, the Oscar de la Renta gown follows a slew of looks by Australian designers Dion Lee, Martin Grant and Karen Gee. Iman Opens Up About Her Marriage to David Bowie: "I Will Never Remarry"